Afternoon tea never looked so good. Whether you fancy traditional British tea or Southern tea, Virginia has plenty of proper tea rooms for your next tea-drinking destination. Presidents have walked the halls of this historic manor in Berryville, where you'll find a selection of curated teas where they blend traditional British afternoon tea with the old-fashioned Southern tea charm. "You are stepping back into a time where people were kinder, more gracious, where life slows down for a moment and you truly get to enjoy the time, season and the moment," said Michael Haymaker, director of design at Rosemont. Rosemont Manor is located about an hour and 40 minutes from downtown D.C. The only way you could know about the British Pantry is if you've driven by it. That's how we found out about this gem of a tea room. This tiny British-style tea room offers creative afternoon teas, like the Winter Warmer, Tears for Downton Abbey and Bunny Whimsy, depending on the time of year and upcoming holidays. Kids seem to love learning the etiquette of using proper tea settings -- and chowing down on the tasty mini-cake bites, of course. The British Pantry is located about 90 minutes from downtown D.C. This pub-style tearoom is located in an 18th-century house known as the Cloyd House. The refurbished home-turned-tavern has guests enjoying premium whole leaf teas in flavors such as ginger root, lavender and peach apricot along with Assam, Kenyan and Yunnan blends. White Oak Tea Room is located about four hours and 15 minutes from downtown D.C.
Crest Hill Tea Room is located in The Plains, an area with some of the best rolling farm fields of Virginia -- and throughout May, Crest Hill is celebrating Mothers Day every day. 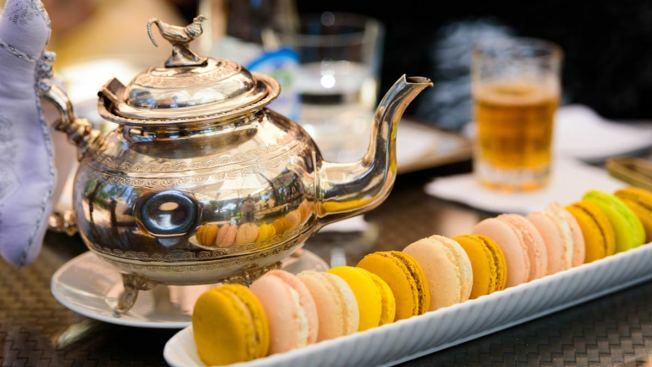 The spot offers a luncheon with petite soup, assorted tea savories with chocolate tier, pastries and veggie garnish. Each guest will also receive a long-stemmed rose, a gift and a 15 percent discount in the store. Crest Hill is located about an hour and 35 minutes from downtown D.C.